This holiday, would you like to give a gift that helps create memories for a lifetime? Still searching for the perfect gift for someone who loves SI as much as you do? 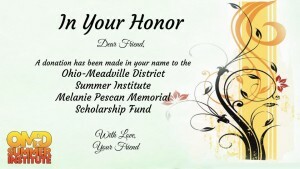 How about giving a gift in their name to the scholarship fund? It’s really easy! Send your name and the name of the person in whose honor you made the donation to me at [email protected] or via a Facebook private message. In return, I’ll send you a printable certificate with your name and the gift recipient’s name on it (see the bottom of this page for an example). Print the certificate, put a bow on it, and voila! A great gift is born! Bonus: if you donate before the end of the year, you can claim the donation on your tax return. Even if this gift idea isn’t for you, I invite you, as you’re shopping and spending and thinking about cold and snow (or maybe not this year! ), to spare a thought for what SI means to you on the other side of the year, and all year long. For many, the Most Wonderful Time of the Year is not the holiday season, but the week that they spend at SI. And also for many, that experience is only possible through the generous donations that others make to the scholarship fund. I invite you to consider setting aside some of your gift giving budget to give the gift of the SI experience to others through your donation. One fewer stocking stuffer for you could mean a happier, more meaningful summer for someone else. Again, the link is here: http://www.cersiuu.org/scholarships/scholarships/. Happy Holidays, let it snow (maybe! ), and thank you for your generosity!